Trying to handicap the home stretch of a pennant race is an exercise in futility. 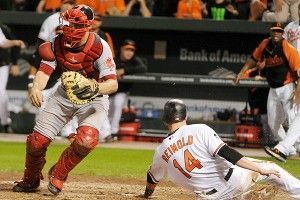 Can Nate McLouth and Lew Ford carry the Orioles to postseason glory? Will Ervin Santana and Dan Haren lead a huge Angels comeback after stinking for most of the season? Could the Brewers pull off a miracle? With so many variables to consider for each of these teams, these questions might seem unanswerable. And, just when you think you’ve got it all figured out, there’s this: Every contender is at risk of getting knocked out by a spoiler. Trying to deduce which lousy teams are most likely to blow up a contender’s season is even tougher. Cleveland is one of several sub-.500 teams with a golden opportunity to ruin someone’s season. The Mariners get six chances to screw with the Angels. The Royals, who’ve already won series against the Rangers, Angels, and Rays over the past month, get seven shots at the fading Tigers. The Twins get three games against the Yankees, six against the Tigers. The Jays play seven against the Yankees, four with Baltimore, three more against the Rays. No team has a better shot at the Spoiler Hall of Fame than Boston: With two series each against the Rays and Orioles and one against the Yankees, they can throw both the AL East and wild-card races into chaos. In the National League, the Mets still have the Phillies, Pirates, and Braves on the schedule. The Marlins have two series against Atlanta, one against Philly. The Padres play the Dodgers and Brewers (and the Giants for six games, though they’ve all but clinched the NL West). The NL’s biggest potential jerks are the Astros, who get 12 straight games against the NL Central’s three wild-card contenders and are playing better than they have all year, with a winning September record through Monday. and watched his 2-2 pitch sail over the wall for a three-run homer, torpedoing the Dodgers’ season. L.A. would get a small measure of revenge 11 years later. The year before the wild card was to be implemented, the Braves and Giants hooked up for one of the greatest divisional battles of all time. Once again, the Giants and Dodgers would meet for the final series of the season. The red-hot Giants won the first three games of the series, giving them 14 wins out of their past 16 games, and placing them in a tie with Atlanta at 103-58, with one game to go. Then the Dodgers annihilated their season. Mike Piazza belted two homers, and the Dodgers destroyed San Francisco 12-1, giving the Braves the NL West crown. The Giants looked primed to grab the NL wild card on the final day of the ’98 season. Heading into the bottom of the fifth inning against a mediocre Rockies team, San Francisco led 7-0. Then the wheels came flying off. Colorado scored six in the fifth and two in the seventh to take an 8-7 lead. The Giants tied the game in the eighth. Then in the bottom of the ninth, lights-out Giants closer Robb Nen, who’d allowed just three homers and struck out 110 batters in 88⅔ innings, faced Neifi Perez, who’d end his career with just 64 home runs in 5,127 at-bats. On the first pitch, the hacktastic, light-hitting infielder launched a game-winning solo shot. Perez’s homer forced a one-game San Francisco playoff with the Cubs, which the Giants lost. Not quite an elimination job, but pretty damn close. After splitting a two-game series with the Astros to close out September, the Reds stood tied with Houston heading into the final series of the season. Even if a division title didn’t work out, Cincinnati only needed to take two out of three from a lousy Brewers team to secure the NL wild card. Nope. The Reds dropped the first two games of the series before scrambling to tie the Mets and set up a one-game playoff to decide the wild-card winner, a game they would go on to lose. The real backbreaker was the first game of that Brewers series. Cincy took a 3-0 lead after four innings, before Milwaukee rallied for one in the sixth and two in the eighth. After hitting Mark Loretta leading off the bottom of the 10th, Reds reliever Scott Sullivan got Jeff Cirillo to pop out a bunt, then struck out Jeromy Burnitz. But two straight singles cost the Reds the game, and eventually, a playoff spot. With nine games to go in the season, the Cubs owned a three-game wild-card lead over the Astros. Houston won eight of the next nine (including seven in a row to end the year), while Chicago went just 2-7. Five of those Cubs losses came at the hands of the Mets and Reds, who won 71 and 76 games respectively in ’04. Five of those losses were also one-run affairs, and three of them came in extra innings. The infamous Rocktober season ended in brutal fashion for the Padres. Despite a four-game losing streak of their own in September, and a mad dash to the finish by the Rockies, the Padres were one strike away from clinching the NL wild card on the second-to-last day of the season. They had one of the greatest closers of all time on the mound in Trevor Hoffman, and were facing Tony Gwynn Jr., the son of the greatest Padre of all time and a decent, but unspectacular hitter. Gwynn got a pitch to handle and tripled home Corey Hart to tie the game, and the Brewers would go on to win in extra innings. The Padres lost again (and the Rockies won again) the next day, forcing a one-game playoff for the right to advance to the League Division Series. The Rockies would prevail in a 13-inning thriller, one won on a controversial play in which Matt Holliday might have never touched home plate. Game 162 of the 2007 season will go down as one of the lowest in Mets history. While the Rockies and Padres were battling down to the final game for the NL wild-card spot, so, too, were the Mets. Actually, forget the wild card — the Mets held a 2½-game lead over the Phillies for NL East supremacy with a week to go. Then they lost five in a row, setting up the final-game showdown with the Marlins. We should probably use the word showdown loosely. The Marlins scored seven runs in 1/3 of an inning, knocking Glavine out of the game in a flash and ending the Mets’ season. Things got a little more interesting in ’08. Again down to their final game of the year, the Mets and Marlins went to the eighth inning tied 2-2. Then Wes Helms led off the eighth with a homer, and Dan Uggla slammed the nail in the coffin by it making back-to-back shots, allowing the Brewers to overtake the Mets and claim the wild card. On the greatest final day ever seen in a major-league season, Boston’s path to elimination got a little help from the Yankees. After fielding a lineup full of regulars to start the game and breaking out to an early 7-0 lead, New York benched their starting position players and starting pitchers. And when the time came to nail down the save that might end rival Tampa Bay’s season, the Yanks went with Cory Wade over incredibly stingy 2011 setup man David Robertson and all-time great closer Mariano Rivera. But let’s face it: When it comes to the end of Boston’s 2011 season, and to the greatest spoiler of the past few years, no one quite stacks up to Robert F’ing Andino.